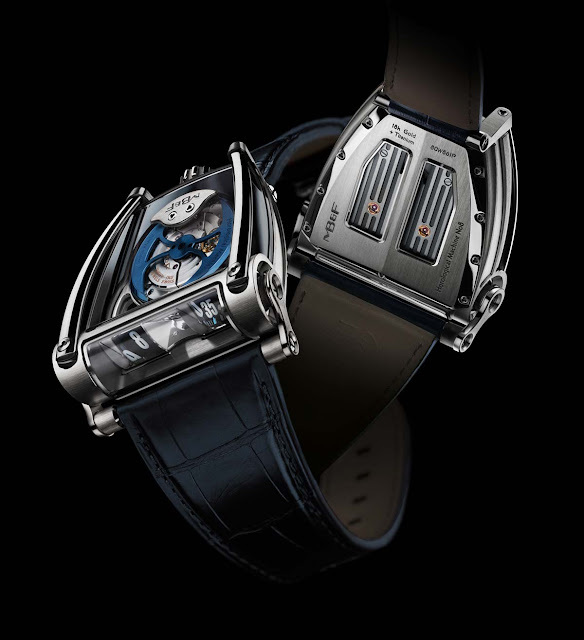 The latest horological machine from MB&F combines a design inspired to Can-Am race cars with forms and details previously seen in other horological machines from the brand. The Canadian-American Challenge Cup, Can-Am for short, was a sports car racing series running from 1966 to 1987. Class restrictions in the Can-Am were minimal and allowed for unlimited engine sizes, turbocharging, supercharging, and basically unrestricted aerodynamics. The new HM8 Can-Am features an angular case (49 mm x 51.5 mm x 19 mm) with the dual optical prisms vertically displaying bi-directional jumping hours and trailing minutes characterising the HM5 and HMX models. The prisms also magnify the indications by 20% to maximise legibility. 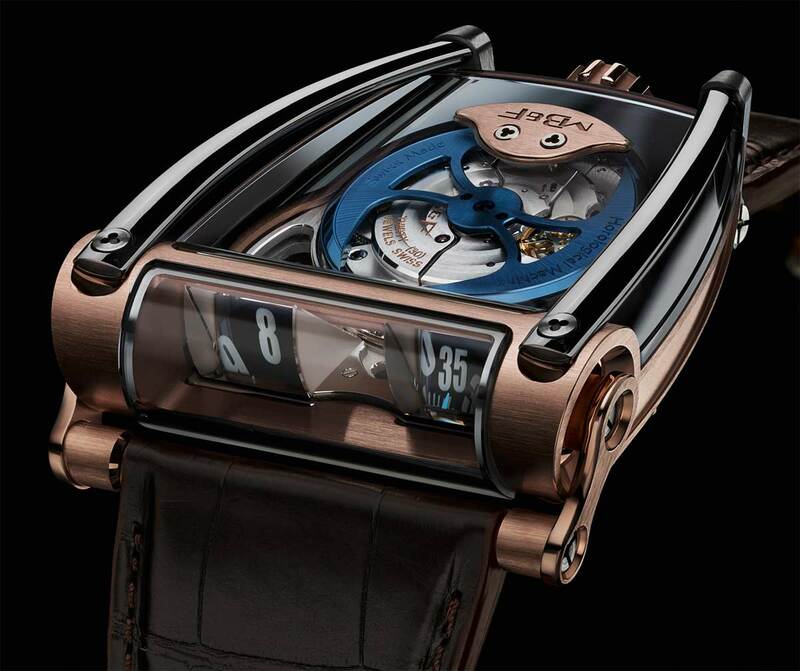 On top, visible through a transparent sapphire crystal engine cover, the open centre of the blued-gold battle-axe rotor allows the wearer to appreciate the circular wave finish on the movement, while the hour and minute indication discs are visible in the corners. 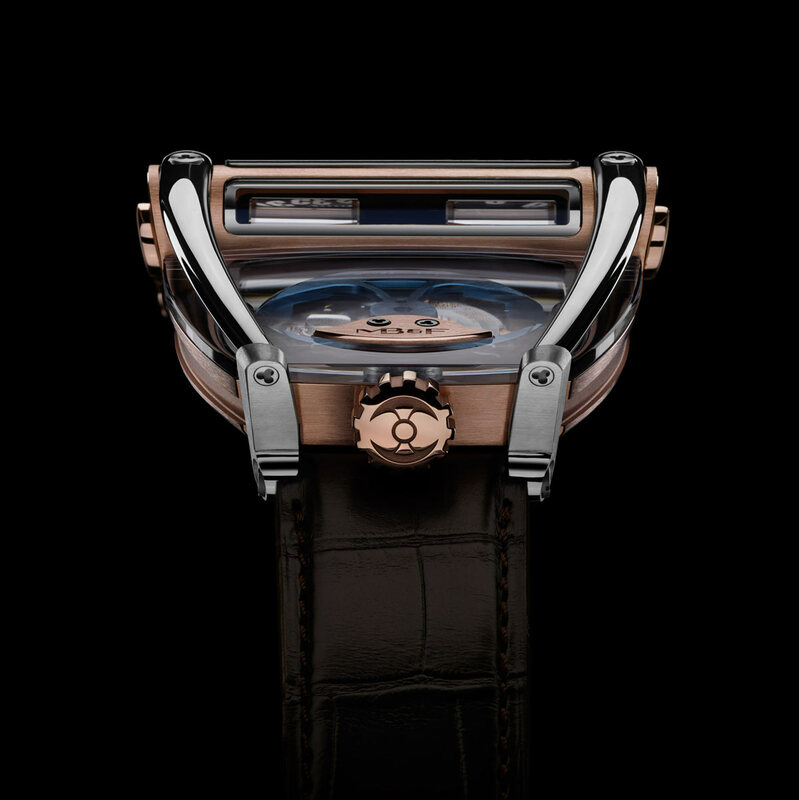 The top crystal is protected by two polished roll bars crafted from a solid block of grade 5 titanium, an alloy which boasts an excellent combination of lightness, strength, and resistance to corrosion. 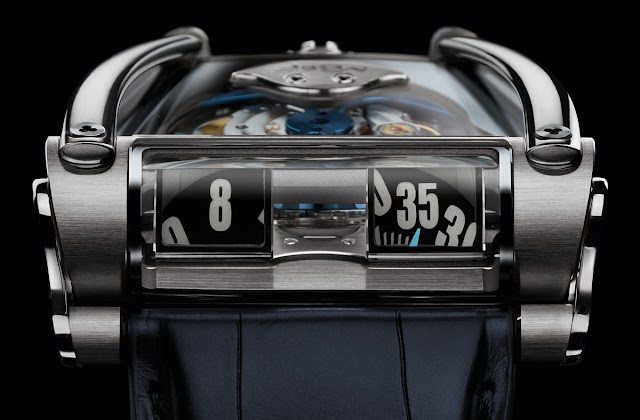 Thanks to the extensive use of transparent surfaces, the time displays are back lighted for better readability. Light also charges the Super-LumiNova numerals on the hour and minute discs for enhanced legibility by night. 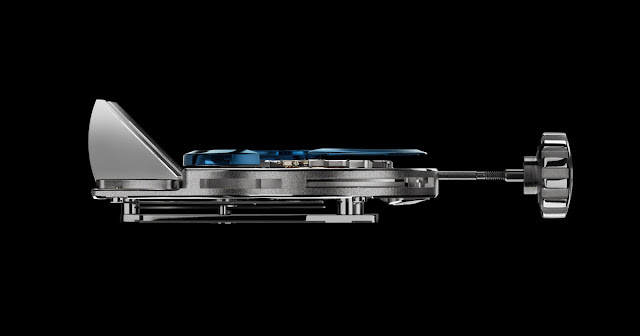 The HM8 Can-Am is powered by an in-house developed bi-directional jumping hour and trailing minute indication module, on a Girard-Perregaux base movement beating at 28,800 vph. The movement is inverted to put the winding rotor on top and modified to drive the prism indicator module. 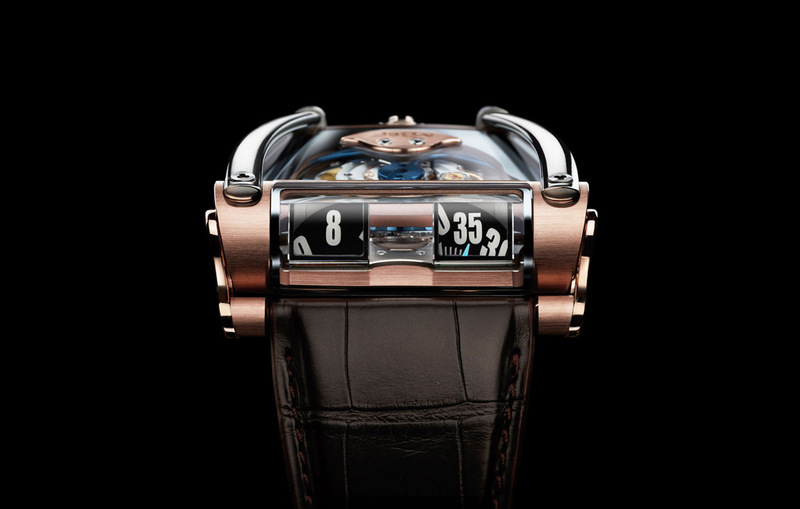 The power reserve is 42 hours. MB&F Horological Machine N. 8 Can-Am. 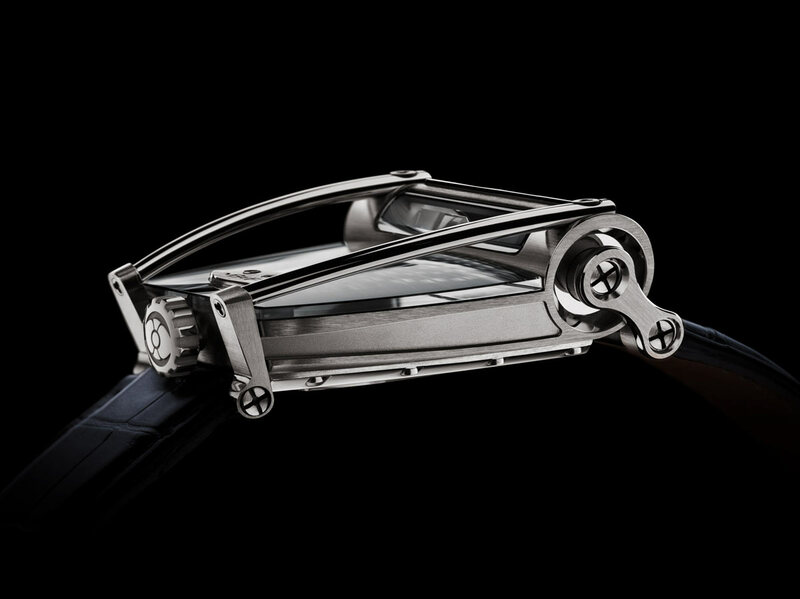 MB&F HM8 Can-Am. The latest horological machine from MB&F combines a Can-Am race car-inspired design with forms and details already seen in other horological machines from the brand. The new HM8 Can -Am is presented in two versions, white gold/titanium and red gold/titanium, with a price of Swiss Francs 78,000 before local taxes.